On Wednesday 25th November four students represented Kingsbury High School at the Bank of England Target 2.0 national competition for schools in which they were required to set monetary policy and justify their decision for the interest rate they set. The Kingsbury team acquitted themselves very well and finished as runners up in the London heat to the The Tiffin Girls’ School. Other competing schools included: The King Alfred School, Ashmole Academy, Sutton Grammar School and Tiffin School for boys. Kingsbury High School students had the fantastic opportunity to showcase their debating skills at the first round of the English-Speaking Union Schools’ Mace Competition last Thursday. On the evening of November 19th, Kingsbury High students from across years 7 to 13 attended the competition, which was held at Haberdashers’ Aske’s Boys’ School. Teams from competing schools were well prepared and it was a tough round. Seasoned debaters, Iman Mohamed and Sakthy Uthayakumar, spoke passionately and convincingly against the motion this house would force the BBC to implement diversity quotas for casts of all their shows. Victory may have gone to the hosts, Habs Boys, but both girls showed great skill and received glowing feedback from the judges. Keen debater, Sara Dehvari, received high praise too, as she formed part of the swing team debating the motion this house believes that the UK government should pay reparations to countries that suffered from the slave trade, making a strong case with just 15 minutes to prepare. Younger debaters had the opportunity to contribute also. Both Xane Miles, in Year 7, and Nouh El-Ouaz, in Year 8, deserve particular praise for thoughtful points made in floor debate. The launch of KHS Unplugged, a series of lunchtime concerts, took place on Tuesday 10th November in The Hub, a new venue within the Kingsbury High Lower school building. The initiative, organised by Mr Dominé, provides an opportunity for students to perform live, in a relaxed environment to an audience of staff and students. The first KHS Unplugged event featured music from Ziena Idani, Laveen Chandnani & Gautam Dahale and was very well received by both students and staff. KHS Unplugged will take place every week B Tuesday in The Hub. Students and staff are welcome to attend and anyone wanting to perform should contact Mr Dominé. 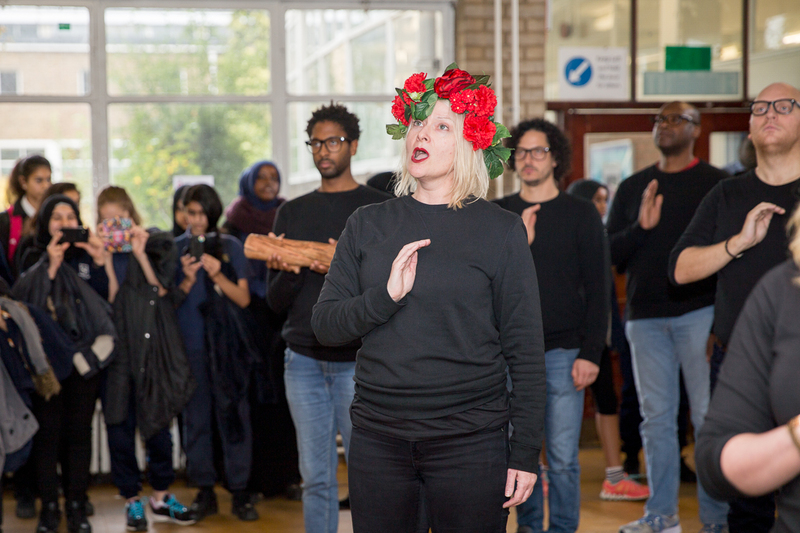 The dulcet tones of opera filled the corridors on Friday 23rd October as the English National Opera’s Opera Squad took over Kingsbury High for the day. Students and staff were introduced to opera, as both spectator and performer, through a range of activities including assemblies, ensemble, choir and workshops. Pop up performances took place in unlikely areas around the school where lucky bystanders heard professional opera singers and viewed their performances at close range. Head of Music at Kingsbury High, Matthew Dominé said “I was particularly impressed by the skill the English National Opera showed in bringing a challenging musical genre, like opera, to our students and to get them all involved and enjoying the opportunity to sing together. The pop-up performances throughout the school were amazing and the students were clearly inspired. There will be future opportunities for our students to experience opera and I, along with them, cannot wait”.